Winter has been part of the Barre-Up family since the doors opened in 2013. In August of 2017, she became business partners with her best friend and took over as the new Co-Owners. From the instant she walked in as a client, she fell in love with the small classes sizes, the instructors, and the supportive, empowering environment of women. Years of gym memberships & studio bouncing were finally over as she quickly learned this was everything she was looking for all wrapped up in one tiny little Groupon voucher (her best Groupon purchase EVER)! She was reaping all the benefits of a leaner, stronger body - but more importantly, her mind & soul did a complete re-shape & re-shift on her goals & overall outlook on life. She took the plunge to get certified in Buti Yoga in early 2014 and then subsequently followed with 200hr RYT, Buti Flow, Vinyasa, HotCore/Sculpt, Barre and Pilates Mat Certifications. She is very passionate about helping others discover their truest selves and encourages her clients to stop devaluing their worth and capabilities. She's helped to build a strong community of ladies supporting ladies and is a firm believer in the phrase "empowered women, empower other women". We can all wear crowns! Winter was voted as one of two "Most Moving Instructors of 2016" for the Raleigh area and was among the "Best Fitness Instructors in Raleigh" for 2017. When not in the studio, she works in Procurement for a nationally based construction management firm and also moonlights as the Vice President of a Triangle non-profit - Models for Charity. Her favorite free time is spent hanging out with her husband - Sam, her 2 step-minis, and her furry babies - Drake & Annabelle. Leah teamed up as business partners with her best friend and took over as Co-Owner of Barre-Up in Fall of 2017. She grew up playing soccer, tennis, running and riding horses. After years of physically demanding sports and playing soccer in college at WVU, she had sadly accepted a fate of potentially never having any flexibility. Once Leah moved to Raleigh from Washington DC in late 2013, she discovered Barre Up and it didn't take her long to fall in love with everything the studio stood for. In early 2014, she decided to challenge herself and become certified to teach Buti Yoga, helping Barre-Up become one of the first prominent studios to offer these empowering, strong classes for women around the Triangle area. 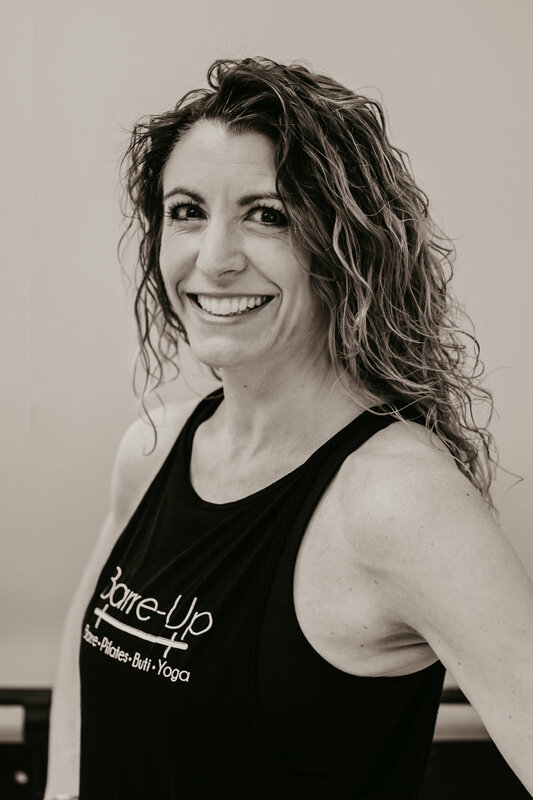 Leah has since been able to become immersed in her passion for motivating and helping all levels achieve their own individual goals and is continuously inspired by the magic that Barre Up brings to the community. Her quirky, upbeat personality and always interesting 'Rhythm and Poetry' music choices are a favorite among our wonderful clients. If she's not in the studio, you can typically find her stop, drop, and yoga'ing around Raleigh with her corgi and camera in tow. In 2017 Leah was graciously voted among the "Best Fitness Instructors in Raleigh". She is currently 200 hr RYT Buti, Buti Flow, Vinyasa, Hot Core/Sculpt, Pilates Mat and Barre certified. Caroline Wall discovered Barre via Pilates, to which she became addicted after a bilateral mastectomy. She was looking for ways to rebuild her strength and flexibility and found that Pilates offered those things and more. The changes in her body that she felt and saw as a result of her Pilates practice gave Caroline the self-confidence she needed during her recovery. For her, Barre has the benefits of Pilates and goes one step further. One of Caroline’s favorite things about the barre workout is that it challenges your body AND mind, creating not only physical strength and a sculpted physique but also mental balance. Caroline is certified as a Barre instructor, a Core Mat I and II instructor through Power Pilates, and as a POP Pilates Instructor. She loves watching her clients meet goals that they didn’t imagine they could. Outside the studio, Caroline loves being with her husband and two sons. She also enjoys tennis, walking her dog and volunteering. Lindsay grew up playing soccer, running and snowboarding before her passion for the outdoors brought her to work as a kayaking and backpacking instructor. She suffered from a herniated disk in 2013 and found that Pilates gave her the strength, flexibility and stability to maintain an active lifestyle. Driven by her successful recovery, she took her Pilates certification with Balanced Body, which ultimately led her to her Barre certification at Barre-Up in 2015. Lindsay loves how every exercise and pose can be modified to suit individual’s needs and is excited to pass her knowledge along! When not in the studio, Lindsay can be found traveling around NC and beyond. She loves to spend time with her husband, Ryan, and continues to find adventures to embark on with friends and family in the Triangle area as well. Kristen luckily stumbled upon Barre-Up when she first moved to Raleigh in 2016. She was immediately inspired by this group of welcoming and supportive women who all shared the goal of improving their bodies and minds. Coming from a background of long-distance running, she loves how the mix of classes here build the strength needed to avoid running injuries. When not at Barre-Up, Kristen can be found being a medical physicist, running, or adventuring the world with her husband. Jaimee first heard about Pilates from her high school Drama teacher. She was immediately intrigued by the use of controlled movement and breathing to sculpt the entire body. With a deep distaste for cardio, this sounded like the perfect workout for her. She tried her first Pilates class her freshman year at Savannah College of Art and Design and immediately fell in love. It was effective and it was a total mind and body experience. She found that she was drawn to the instructors who incorporated music into their workouts and after graduating in 2013, she found POP Pilates. Jaimee loved how POP Pilates mixed the fundamentals of Pilates with the fun energy of music and rhythm. This was exactly what she had been looking for! Pop Pilates changed her entire outlook on fitness. Workouts became fun and fitness became a lifestyle. She even developed a working relationship with cardio! Jaimee knew that she had to share the POP Pilates format, so she decided to become a certified member of the POP Army and currently teaches around the NC Triangle. She has recently added Pilates Mat & Barre to her resume and hopes to become certified in Indoor Cycling and Yoga as well! When not instructing, Jaimee makes good use of her Film degree and works as an Assistant Post Producer for Figure 8 Films in Carrboro. She also enjoys cuddling with her pet rats (yes, rats), hanging out at cozy breweries and reading sci-fi novels. Margaret grew up being physically active and always had a strong interest in nutrition and overall health. She grew up playing tennis, basketball, swam, and cycled. While attending NC State, she decided to try something new by joining the “Dancing with Wolves” ballroom dance team. Her love for dance began as she was able to bridge exercise with art. Upon graduation, she picked up ballet to continue her passion for dance. In trying to find an exercise to compliment ballet, she luckily stumbled upon Barre-Up in 2013 and instantly fell in love with the precise movements and overall full body work out as well as the supportive, nurturing atmosphere. Like many instructors at Barre-Up, she’s a client transformed into an instructor and began August 2016. She enjoys teaching to up-beat music and adding subtle ballet influences to all of her classes. Margaret lives in Raleigh, NC ( a native from Atlanta). When not teaching, she enjoys dancing, traveling, and random adventures. Jen is a FT mom, wife, and learner as well as joy & peace seeker. She is also a PT speech therapist, yoga instructor, runner, knitter and concertgoer. She found the Barre-up studio when looking for something more after 20+ years of running and practicing yoga (mainly Vinyasa styled). She found that Buti Yoga combined the cardio, strength and flexibility aspects nicely in one packaged hour and while she continues to enjoy recreational running and other types of yoga she was also searching for a balance. Having always been a good student, becoming an instructor allowed her to learn more, practice better and prepare to share the joy of Buti, Vinyasa, and Yin yoga with others. She is trained in RYT-200 with certifications in Buti Yoga, Kids Yoga and most recently Yin Yoga where she studied with Bernie Clark in Vancouver, British Columbia, Canada. She hasn't regretted one iota of the journey and thoroughly enjoys teaching classes just as much as she continues to enjoy taking classes. Byron is a native of Gainesville, FL who was raised in Charlotte and is a NC State graduate (Go Wolfpack!!)! He’s been a law firm manager for 13 years and also does acting and modeling. Fitness and dancing have always been important to him, so 4 years ago, he decided to leap into Fitness instructing and has never looked back! Byron’s excited to join the Barre Up family and to be able to "break it down" with all of you. A recent yoga-holic, Elisabeth considers Barre-Up as a second home and inspiration for her to become an instructor. She most enjoys the energy, friendly and accepting environment, and mental indulgence from the workout and classes. She has also greatly broadened her music knowledge as an instructor. Elisabeth is RYT 200 and Buti Yoga certified. She teaches Buti, Vinyasa, and Yin Yoga. Aside from yoga, Elisabeth keeps busy working and traveling for her market research company which she started with a business partner, 14 years ago. When she is not working or practicing yoga, she can be found enjoying time her with family, bicycling with her husband, or taking every opportunity to visit her two daughters. Orla teaches barre and deep tissue therapy ball massage at Barre Up. She loves the precisely focused movements and mind-body connection of these practices, and how doing them diligently over time — with ever improved form and technique — only makes them more challenging and transformational. In addition to barre and therapy ball massage, she is certified in kundalini yoga and Yoga Tune Up (RYT-300+), Power Pilates Mat I & II, and Little Guru children’s yoga. She also keeps active by dancing Argentine tango, swing, salsa and more. Marcy is another client turned instructor after just a few months of happening upon Barre-Up! She immediately became addicted to the combination of classes for their blend of strengthening, stretching, and healing. Her idea of a perfect workout is one that tones the body, relieves the mind, and is good for the soul. In her class you can expect to be challenged, learn to use your breath, and hear “y’all are doing great” a bunch of times. When she’s not in the studio, she’s helping finance North Carolina’s family farmers, helping out on her family’s produce farm, or at the coast with her family and boyfriend. As a dancer through college, Lisa always loved moving to a beat. The lack of adult dance classes led her to replace dance with running, but she kept getting injured due to the lack of proper cross training. Lisa found Barre-Up after a friend suggested she try barre classes instead of wasting money on a gym membership she never used. She became obsessed. After a few classes turned into a monthly membership, her runs got easier, injuries diminished, and she felt stronger and more confident that she had in a long time. Barre became more than cross-training, so much so, that she got her Barre certification in 2016. She enjoys teaching the early morning classes and making them fun, upbeat, and "Choose your own adventure" style to get the day started. She loves incorporating exercises you can do at the office or at home to promote overall health and wellness to make sure everyone is a rockstar from the inside out! In her free time, Lisa enjoys taking care of her zoo (2 dogs, a cat, rats, turtles & a fish! ), training for run-ventures with her better half, getting caffeinated at Cup A Joe, reading all the things, and geeking out over fandoms. Katie fell in love with barre after feeling her body become so much stronger and more flexible after just a few weeks of classes. She tried pretty much every form of exercise, and to her, the combo of classes at Barre-Up make the perfect balance of strength training and stretching to achieve a healthy body and mind. She feels that it is so empowering, and loves both taking and teaching classes at the studio. She likes to keep her classes high-energy, and always want clients to leave the studio feeling like they’ve challenged themselves just a little more every time. Amanda began teaching group fitness in 2006, teaching spin, kickboxing, Pilates, yoga and circuit classes. Over the past three years she has been practicing barre as a student and has LOVED the results! She is excited to pass along that enthusiasm for barre as well as bringing in some of her experience from other genres to the studio. Along with her barre certification, she is currently working on her RYT-200 and will graduate in April. Amanda is a native North Carolinian and recently moved back to Raleigh from California with her husband and two kids. Amanda spends her time outside the studio as a stay-at-home mom, but also enjoys ballroom and country western & swing dancing. She holds two world championship titles in country western & swing dancing. Always interested in exercise and being mindful with nutrition, and having delivered her first child in early 2013 - she didn’t really have a plan to get her pre-child body back. Balancing work life and being a new mom, Megan found Barre-Up, thanks to Winter! Megan loved training with the fantastic instructors to gain strength, flexibility and confidence. Fast Forward to baby #2- Megan religiously went to all the classes offered at Barre-Up through her pregnancy, due date and past. Becoming an expert in pregnancy modifications (through sheer practice) at the Barre. Megan got her Pilates Meets the Barre Certification in April 2016 and was recently was certified in Buti Yoga. Megan lives in Raleigh with her husband, 2 toddler daughters & boxer dog. Tiffany started practicing yoga about 10 years ago, and immediately fell in love with the physical & mental challenge. She found herself practicing daily and slowly transforming her life and becoming a calmer and more peaceful person. In 2014, Tiffany completed her first RYT-200 training and have since completed an additional 270 hours of formal training led by teachers Bryan Kest , Claudine Camperlengo, Quinn Reynolds and Emily Wallace. She is humbled and inspired by her students and grateful to have the opportunity to share yoga with others.